Alana Bennett, conference, demonstration, hurdy gurdy, instrument, music, performance, Perth, poem, ‘Receptions’, University of Western Australia, WA, Western Australia. 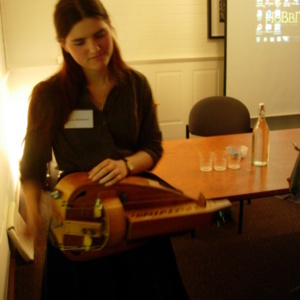 This photograph shows Alana Bennett playing a six stringed Phoenix Standard hurdy gurdy made by Helmut Gotschy in Germany (www.gotschy.com). The hurdy gurdy is a stringed instrument played by using a crank-turned wheel. It developed from fiddles and was first used during the medieval period. The predecessor of the hurdy gurdy, the organistrum, is first mentioned in a treatise found in a manuscript written at Augsburg (Germany) in c. 1100. Alana presented a paper at the ‘Receptions: Medieval and Early Modern Cultural Appropriations’ conference held at The University of Western Australia in August 2012 and gave an impromptu demonstration of the hurdy gurdy during a break. ‘Receptions’, Alana Bennet, conference, demonstration, hurdy gurdy, instrument, music, performance, Perth, poem, University of Western Australia, WA, Western Australia. “Hurdy Gurdy demonstration,” Medievalism in Australian Cultural Memory, accessed April 23, 2019, http://ausmed.arts.uwa.edu.au/items/show/1022.